The 5-6 grade and 7-8 grade quiz bowl teams have had great success this year. So far the 5-6 grade team has competed 5 times. The first meet was our home meet, and we let nerves get in the way. 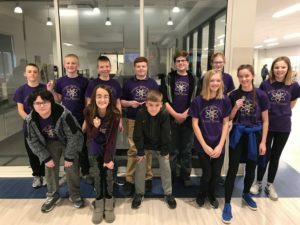 We did not place at this meet, but we followed that up with the online Great Plains quiz bowl where we competed against about 25 teams across the midwest. 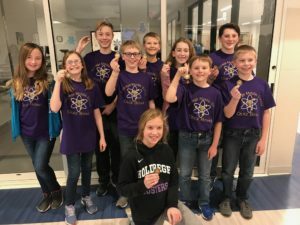 The Holdrege 5-6 team got first with a score of 1316. We got 95% of the questions correct. Then, this team competed in Cambridge and earned 1st out of 10 teams. In January, they have competed in the ESU 11 meet against 12 other teams and brought home the gold. They again earned first place in Arapahoe this past Monday. The 7-8 grade team has participated in 6 competitions. This is a large group and we ended up splitting our team into 2 for our home meet. The teams won both 1st and 2nd place at home in November. They earned 1st out of 10 teams in Cambridge, 1st out of 8 teams at Franklin, 1st in Bertrand, and also 1st in Arapahoe this last Monday. They also competed in the online Great Plains meet and earned 3rd place with a score of 1261. As the coach of these talented teams, I often compliment them on their impressive intelligence. However, I remind them just as often, that they wouldn’t be here if it weren’t for the exceptional education that they receive from Holdrege Public Schools. As a graduate of Holdrege myself, I have always known that we offer our kids an excellent education. Since taking over the duties of coaching quiz bowl, I have only solidified that belief. We have a group of outstanding teachers that have went above and beyond to do their jobs, and our students are reaping the benefits. The middle school quiz bowl teams would like to thank all of the teachers they have had over the years that have helped them with their success. We applaud your hard work. We hope to continue to honor you with our performances.